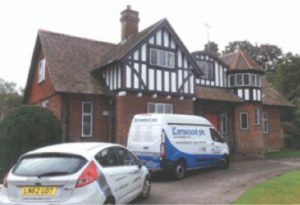 An outbreak of Dry rot (Serpula lacrymans) has now been eradicated at a beautiful detached house built in the 1900’s in Marlow, Bucks. 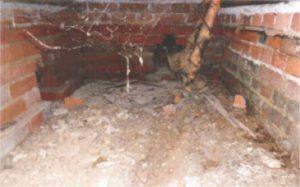 This outbreak was caused by timber being in contact with damp masonry and damp chimney hearths. The treatment in this instance entailed the affected timbers being removed and destroyed, the fire hearths being excavated and the wall plaster being removed. The brickwork was then irrigated by drilling into the walls and injecting a fungicidal dry rot biocide into the bricks. The work also required the sleeper walls below the floor to be rebuilt and the floors replaced with pre-treated timber. The treatment is now backed by our comprehensive guarantees given our client complete peace of mind.